Take the #20 or #21 BC Transit bus south to Creekside or Bayshores, and walk approximately 5-10 minutes on the Valley Trail to the lake. 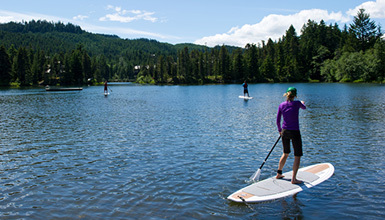 Take the #20 or #21 BC Transit bus south to the first stop or third in Creekside, and walk approximately 5 minutes on the Valley Trail to the lake via the underpass, or past Nita Lake Lodge. Rainbow Park is located on the west side of Whistler Valley. It's a pleasant 20-minute bike ride along the Valley Trail from the Village, just off Alta Lake Road. Rainbow Park has lots of space and was the site of the historical Rainbow Lodge built by Whistler pioneer Myrtle Philip. 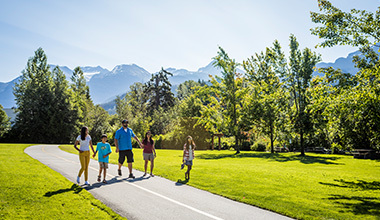 This smaller park is close to the Creekside neighbourhood of Whistler. Take the #20 or #21 BC Transit bus south to the Alta Vista stop and walk approximately 5 minutes to the lake. Take the free Lost Lake Shuttle #8 to Lost Lake Park. Buses run daily from Mid June - Early September. 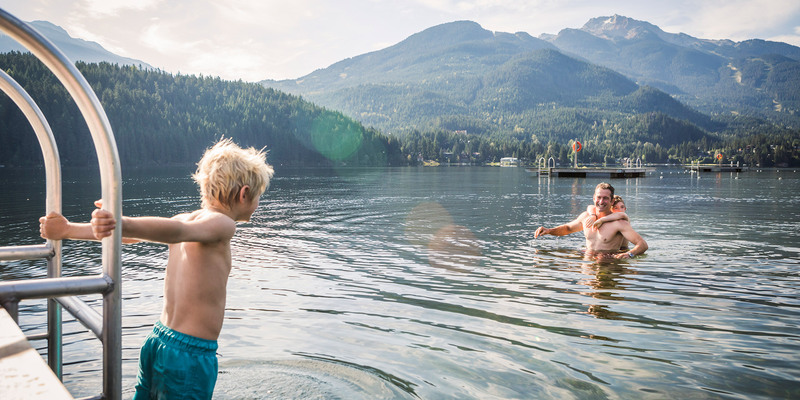 Take the #30 BC Transit bus north to Rainbow Estates or Emerald Estates stops, and walk approximately 5 minutes to the lake. *Please note all dates, hours and park operations are subject to change. Trees rock, and so does slacklining in the summer sun. 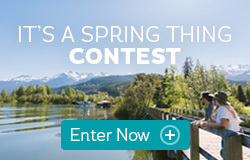 Find out where and how you can slackline in Whistler without damaging our leafy friends.